Home » Nurse Delivers Her Own Baby Alone In Her Bathroom! 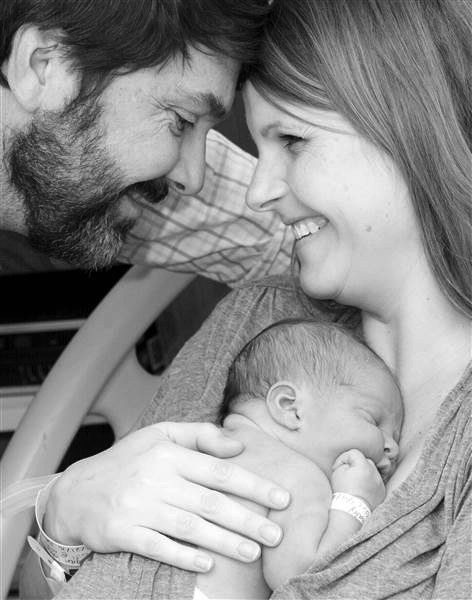 Megan Whaley has been a labour and delivery nurse for 11 years. Thankfully all of her training and experience came in handy when her baby decided to arrive before she could get to the hospital! The mom-to-be was 40 weeks and 2 days pregnant when she started to feel contractions around 9 a.m, She called her husband to come home from work, and planned to go to the hospital when he arrived around 10:30 am, but her baby had other plans.. Instead, when her contractions grew more intense, they called an ambulance. “I couldn’t really talk at that point,” she recalled, because she was in so much pain. But just after her water broke around 10:20 a.m., she felt the urge to push. So while her toddler son watched television nearby, Megan went into nurse mode and covered the bathroom floor with towels and wadded up more towels between her legs to protect the baby from a fall. Shortly after she delivered Emery’s head, she couldn’t get her body out and was worried the baby was stuck. Once the 8-pound, 3-ounce was wrapped in towels, she began crying. Megan’s husband was coming up their long driveway when heard the cries of a newborn through the phone. “I knew it wasn’t Deegan,” he joked. Tending to his mom, Deegan checked on her a few times in the bathroom, patted her on the head and even brought her a refreshment shortly before his sister was born. When the paramedics arrived they took the family to the hospital. Now that life is back to normal Megan is thankful for her little girl.